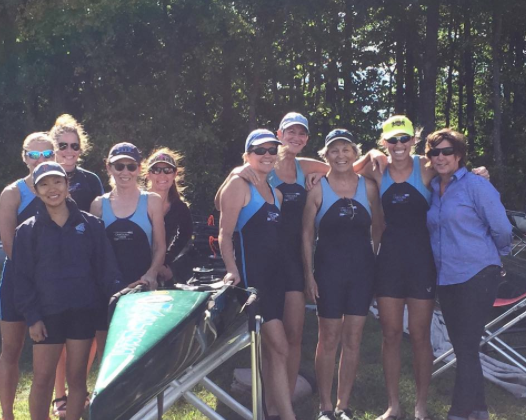 CMCC offers sweep rowing for women over 18 years old. We row out of the UNC boathouse, and are affiliated with the UNC Men’s team. Our members have a range of rowing experience and competitive interests ranging from recreational rowers to competitive racers. Interested in joining the fun? We have opportunities for experienced rowers and women new to the sport. Lisa Schlenker has joined the Carolina Masters as our club coach. Lisa is a former national team rower (10 years!) winning three world championship silver medals, and in 2004 she represented the United States in the women's lightweight 2x. Lisa is also holds two 2k world records. The women's sweep team membership consists of a wide range of ages (ranging in age from the early 20s to the late 60s), interests, and availability. Some members of the team train seriously for and attend races, while others have recreational/fitness interests. We work to accommodate the spectrum of interest and availability on the team. CMCC rows out of the UNC boathouse located on University Lake, in Chapel Hill, NC. The boathouse has 3 bays housing eights, fours, pairs, doubles, and singles. We share our boathouse with the UNC men's and women's rowing teams. The CMCC has two eights (Vespoli and Hudson), two fours (Vespoli and Swift), two doubles (Fillipi and Hudson), and several singles (Hudson, Swift, Maas).